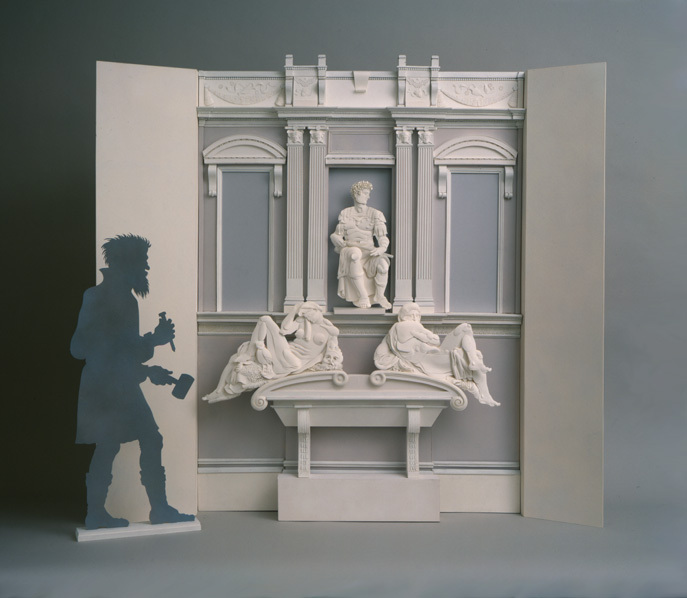 Michelangelo's Tomb of Giuliano Di' Medici: Done as part of a Gucci window series called Five Italian Geniuses Wish You a Happy Holiday, this 4 1/2' foot paper sculpture shows the artist's ghost at left. 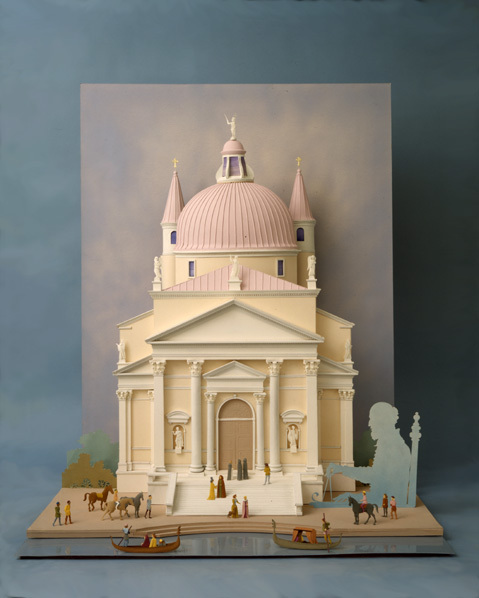 Palladio's Churdh of the Redemption (il Redentore): For Gucci Italian Geniuses series, the great architect's Venetian masterpiece, paper sculpture about 4 1/2' tall. Ghost of Palladio draws up the plans. 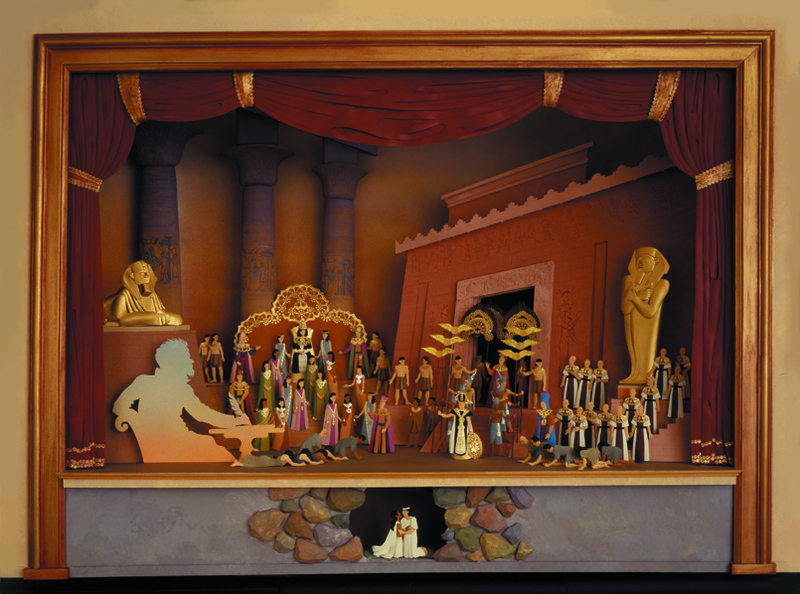 Verdi's Aida: Another in the Gucci series, this 5' long paper sculpture shows the first act triumphal entry of Rhadames, returning victorious from war with the Nubians, and the last act, where Rhadames is buried alive with his love, Aida, as punishment for their illicit love. The ghost of Verdi is writing the opera. 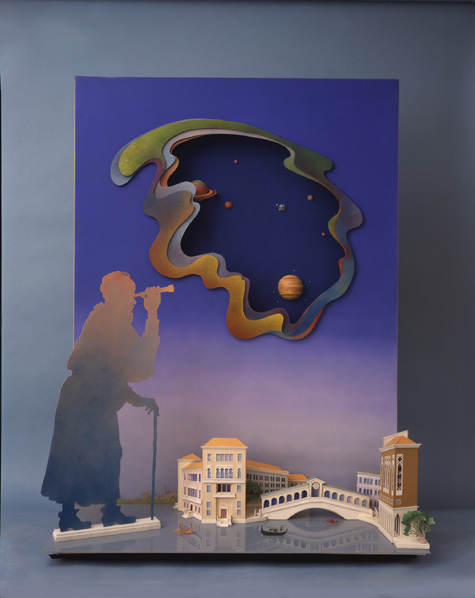 Galileo Contemplating the Movement of the Planets: Part of Gucci series, 5' tall, showing the ghost of Galileo, telescope in hand, watching the sky above his native Venice. 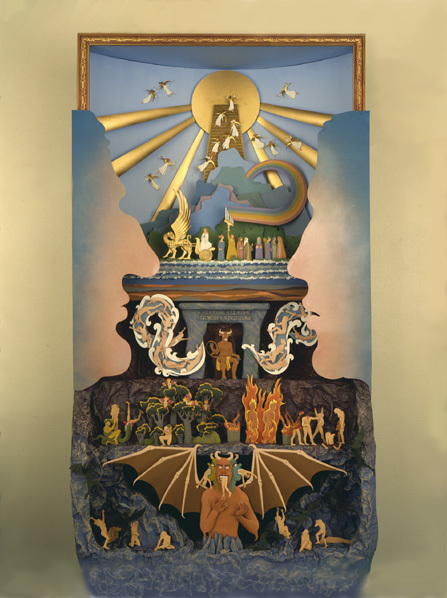 Dante's Divine Comedy: part of Gucci Series, 6' tall paper sculpture shows the entire afterlife universe from the bottom ring of Hell all the way up to the celestial spheres of Heaven. Dante, in profile at left, and his beloved guide, Beatrice, in profile at right, contemplate the sufferings and sometimes redemption of the human race. 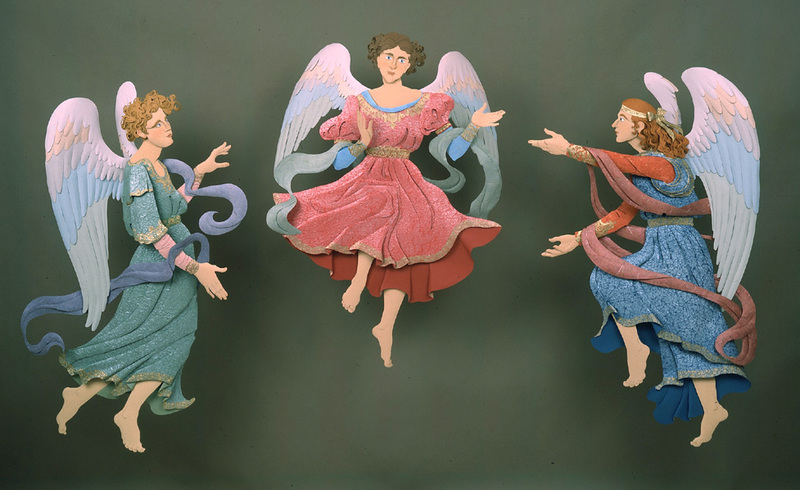 Paper Angels: Done as Christmas window for Fortunoff's New York Store, they are life size. 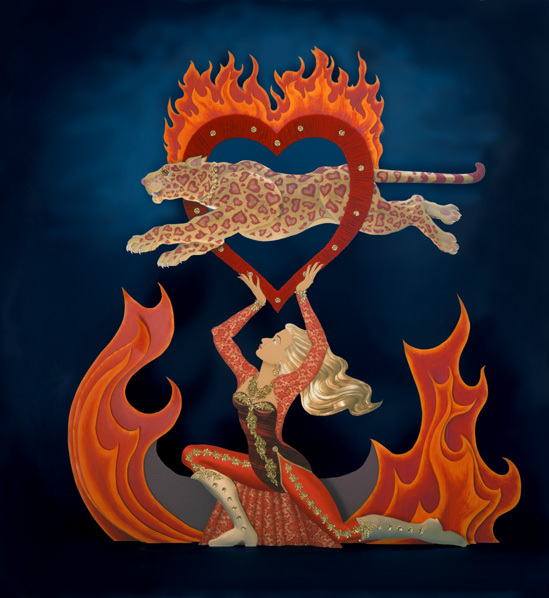 Hearthoop: Valentine display for Fortunoff, showing a leopard with heart-shaped spots, jumping through a flaming heart-shaped hoop held by circus performer. Figures life size. 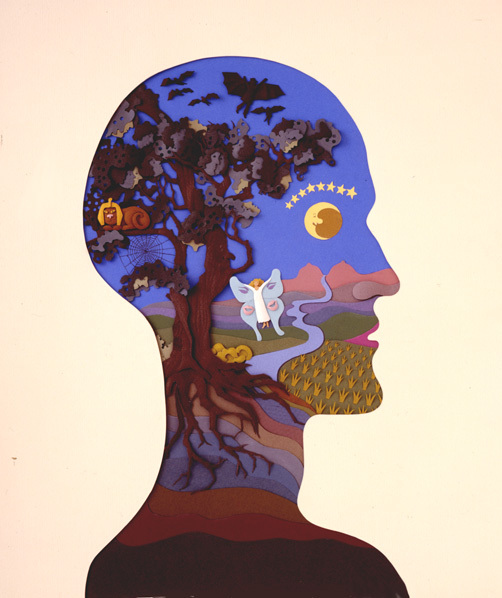 Mental Health: This piece and the subsequent three pieces done for chapter headings for The Good Health Fact Book, published by Reader's Digest. 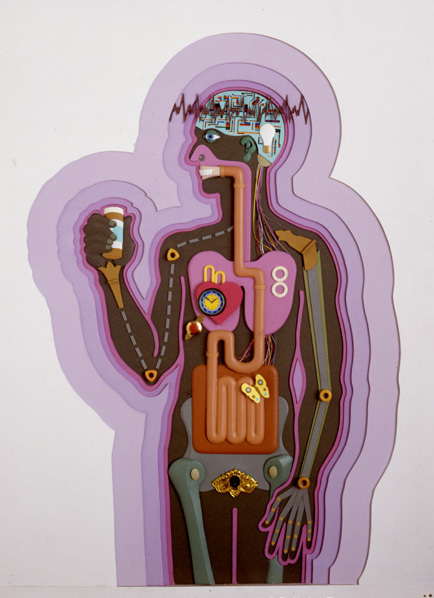 This illustration uses images that may or may not circulate in the mind of the average human. All these illustrations are about 2'tall. Chronic Disease: For Good Health Fact Book, chapter heading illustration, with imagery abstracting various health conditions. 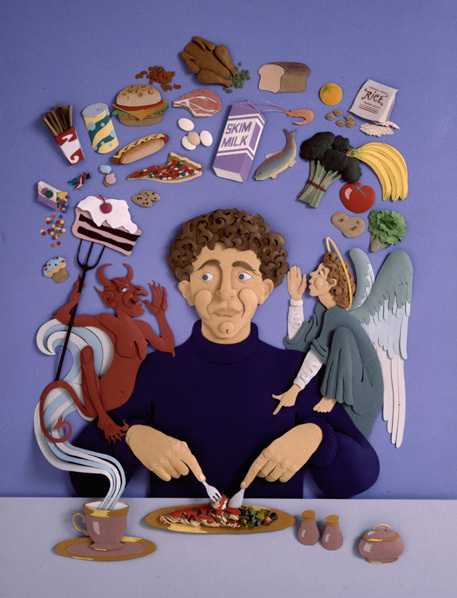 Should I be Eating This: chapter heading on nutritional choices, with central character torn between temptation and virtue. Midlife Crisis: Chapter heading on same subject, middle aged man realizing his biological clock is ticking away. 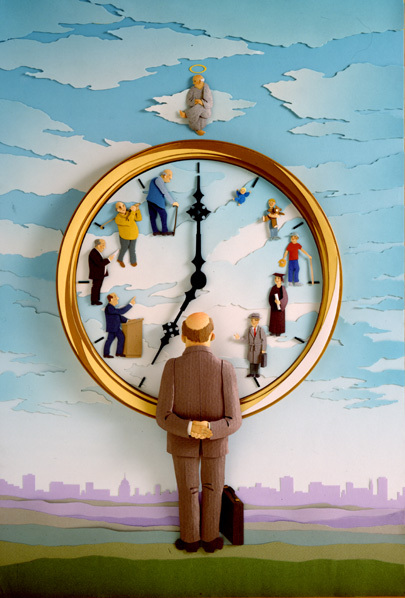 Various stages of life represented by each of the numbers on clock face. 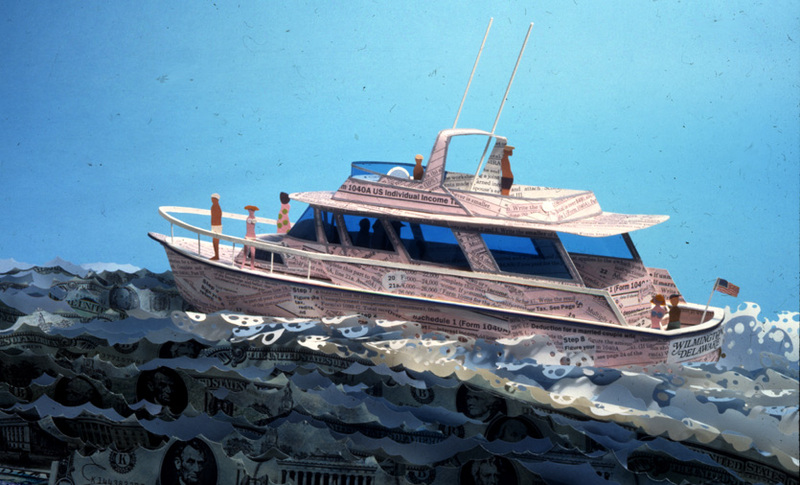 Tax Yacht: Illustration for a story about wealthy people who deduct luxuries from their income taxes. Yacht is made of tax forms, and sails on a sea of money. 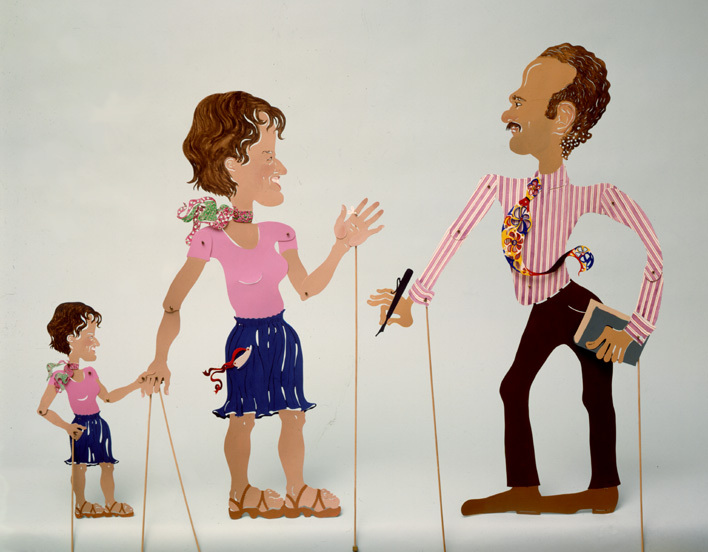 Shadow Puppets: cut paper in the style of Indonesian shadow puppets, done as caricature portraits of friend and his wife. 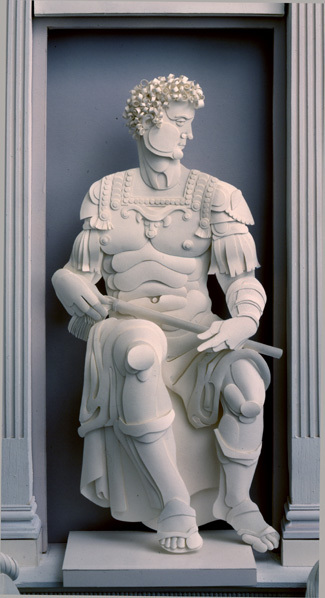 24" tall.